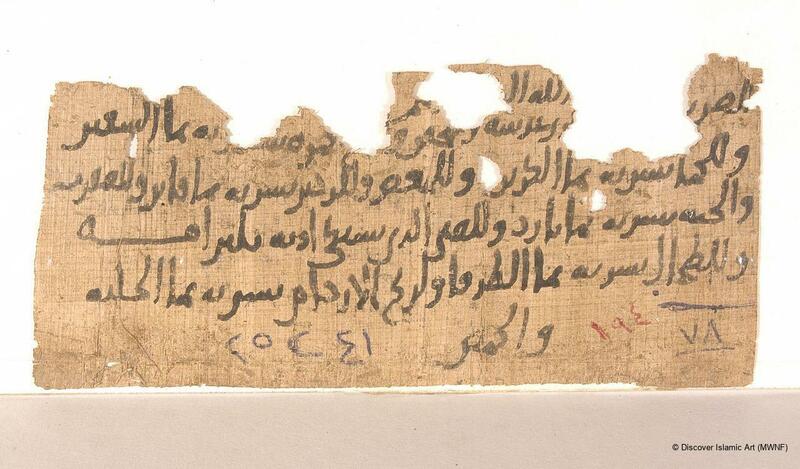 Papyrus, written in black ink. The healing power of plants was well-known since the early Islamic period, for they were used to produce simple drugs concocted from various ingredients. Medicines were prepared by doctors and druggists (medicinal herbal specialists or attar) either in a hospital setting or in small pharmacies. The aloe leaves were pressed and preserved until they were needed. They were used in the treatment of other illnesses, in addition to those mentioned in the prescription, such as aching joints and sore eyes. Aloe was also used in the production of ink. From the early times, simple and compound medicines using extracts from plants were prepared by physicians and druggists and were highly effective. This prescription is based on the use of the aloe plant in curing various ailments. 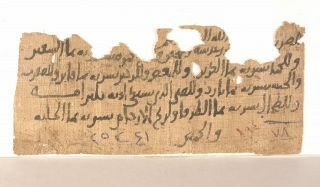 The document has been dated by comparison with a marriage certificate and a letter, both of which are also in the Museum's collection, and the similarities with regard to the style of the kufic script together with the papyrus on which they are all written. The marriage certificate is dated AH 91 (AD 709), and the prescription AH 106 (AD 724). These items are preserved in the Museum of Islamic Art in Cairo, the first bearing the registry number of 25295 and the second, 22999. This piece was donated to the museum by Doctor Henry Amin 'Awad in 1974, amongst many other pieces that he donated to the museum, which included medical and surgical implements and various Islamic coinage. Henry 'Awad is considered one of the biggest collectors of artefacts in Egypt, who has also undertaken studies on branches of the Islamic arts. Doctor Henry Amin 'Awad who donated this document to the museum related that he bought this piece, along with another artefact, from some collectors who gathered together archaeological finds from amongst the ruins of the city Fustat, and sold whatever they found. This was before the Egyptian law on protection of antiquities was passed. Hammad, al-Sayyed, M., Adawat al-Kitabamin al-Fath al-Arabi hatta al-'asr al-Mamluki [Writing Implements from the Arab Conquest to the Mamluk Period], MA thesis, Faculty of Arts, University of Sohag, 1982. Ibrahim, H., Sina'atal-Alwan wa al-Asbagh wa al-Ahbar [Production of Colours, Dyes and Inks], PhD thesis, Faculty of Arts, University of Sohag, 1982. Isa, A., Mu'jamasma' al-Nabat [Dictionary of Plant Names], Cairo, 1930.
al-Nuwairi, Shihab al-Din A., Nihayat al-Irab fi Funun al-Adab [The Culmination of Skill in the Literary Arts], Cairo, 1929.